This month we thought a table you can print out and take to the beach could act as a provocative thought starter. 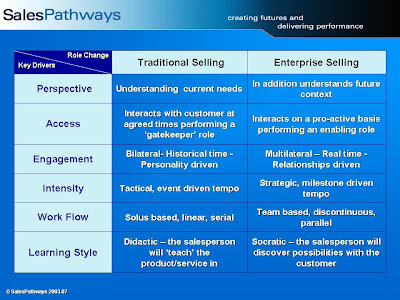 We were asked by a client to look at what change would be involved in moving from a vertical, functionally focused sales approach where the salesperson plays the traditional role of business winner and main contact point, to a company-wide, multi functional sales effort where the salesperson acts as the coordinating lead. Where we trialled this we found the account value increased more quickly through additional and extension sales, customer delight increased and the sales team’s job satisfaction flowed suit. The company quickly rolled-out this approach to all its key customer groups. We captured the main areas in the table above. Because of the pan-company nature of this type of selling we have termed it Enterprise selling. If after your holidays you would like to talk some more about this approach please contact us.